There is a lot more of Sevilla to be seen. This tower for instance. It is the Torre del Oro, the golden tower. It used to be a part of the Moorish defensive works against the Christians. Across the river there is another small tower. They used to put a chain between both towers, to prevent ships from sailing up the river. Didn't London do something similar with the Thames ? That didn't work, as I recall. Columbus was an Italian, he had his training in Portugal and he persuaded the Spanish king Fernando and queen Isabel to fund his tour via the west to India. In the year Spain was completely reconquered from the Moors, Columbus found America. 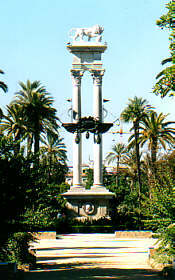 The monument below is for Columbus, as well as for Fernando and Isabel. 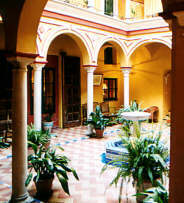 The Museo de Bellas Artes is housed in a former monastery. 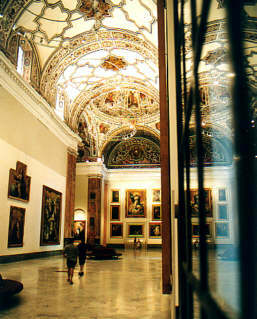 Some beautiful paintings and religious art can be found here, but the building is worth a visit in itself. Just have a look at this place! 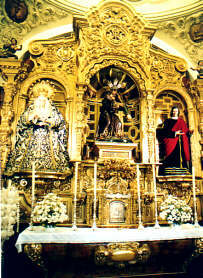 In Sevilla there are lots of churches. Especially in Santa Cruz, the neighborhood of the cathedral, every other building seems to be a church. Just walk in, have a look at the golden altars and burn a candle. The best time to walk in, is in the morning or between 18:00 and 19:00, when most of them are open and you don't disturb the people coming in for mass, which usually is around 19:30. 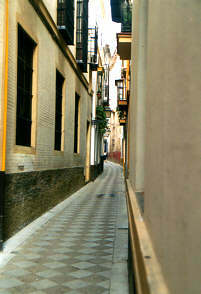 A road, just as narrow as this one, lead to our hotel. We were supposed to drive in with our car, so the valet could put the car in the hotel-garage. We thought it to be too narrow, but later we saw much bigger cars than our Clio driving here. Every house (and our hotel) has a patio, with a fountain in the middle. It (the patio, not the fountain) is covered with cloth to provide shadow. This is a colorful sign for a tapas bar. 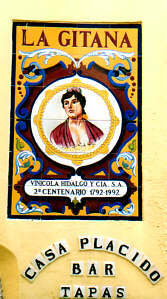 There are many many tapas bars in Sevilla. Please count them, and let us know the exact number. Modern art can also be found in Sevilla. We went to the museum for Contemporary Art, at the Cartuja island. The world exhibition was on this island in 1992. The museum has changing exhibitions. Some of them we liked, others we didn't like. But they change, so they will probably be different when you get there. Flamenco is a way of life. Singing, playing guitar and dancing till late in the night. 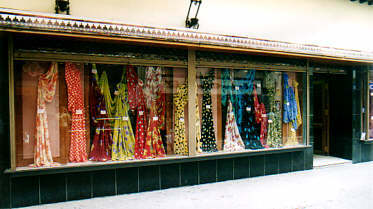 At daylight you can go shopping: a piece of cloth with dots for a new flamenco-dress, or perhaps a complete designer-dress. 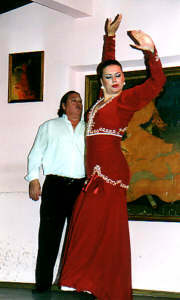 In Holland dresses with dots are no fashion, and flamenco can only be found in theatres. No dots for us. Estan locos, estos Romanos. Or, as the Dutch Asterix and Obelix say: Rare jongens, die Romeinen (Strange guys, those Romans). 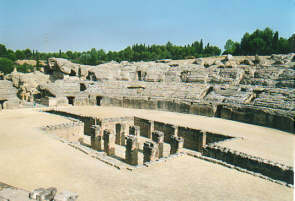 Near Sevilla you can find Itálica, the remains of a Roman city. Here you see the amphitheatre. It can house much more people than lived in the city, so it was probably an attraction from all over Spain. 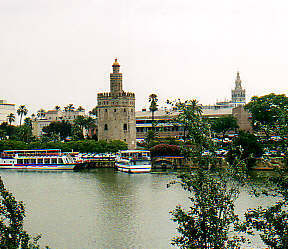 Itálica was deserted when the river Guadalquivir took another course, and Sevilla was founded. Because the people in the past centuries recycled building materials like stone and marble, there is not really much left of the place.